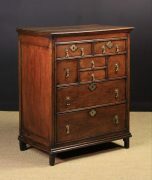 A Small Queen Anne Oak Chest of Drawers. 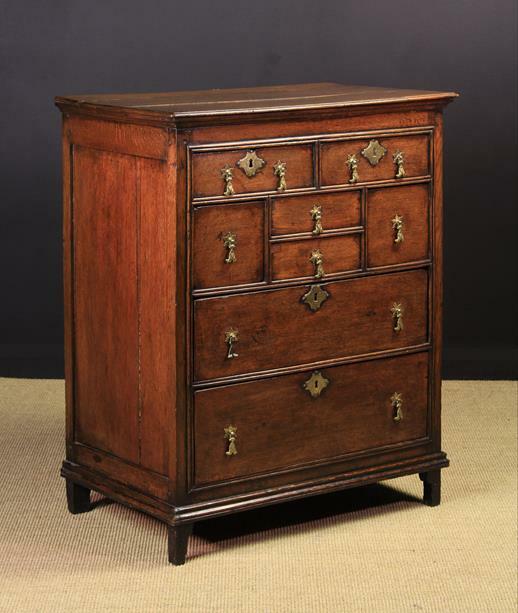 The moulded top above a pair of upper drawers over two small centre drawers flanked by side drawers and two long drawers below, framed in twin reed moulding and fitted with brass drop handles on petalled mounts with incised quatrefoil escutcheons. 38 in (96 cm) high, 29½ in (75 cm) wide, 18½ in (47 cm) deep. 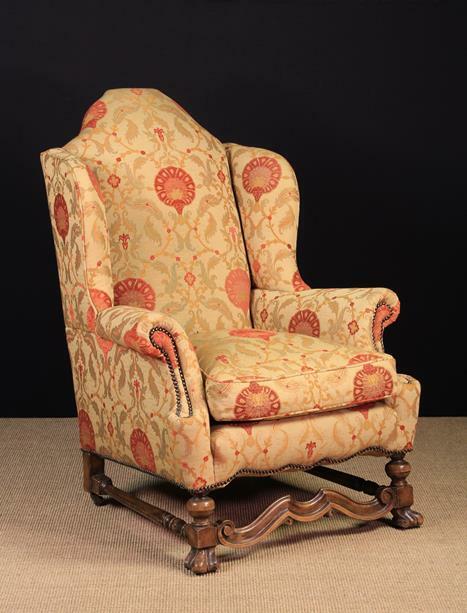 An 18th Century Style Upholstered Wing Armchair with out-swept scroll arms, covered in a linen type fabric printed with medieval style birds & beasts with linked oval chequer bands on a terracotta ground, 41 ins (104 cm) high, 31½ ins (80 cm) wide. (Pre 1950). 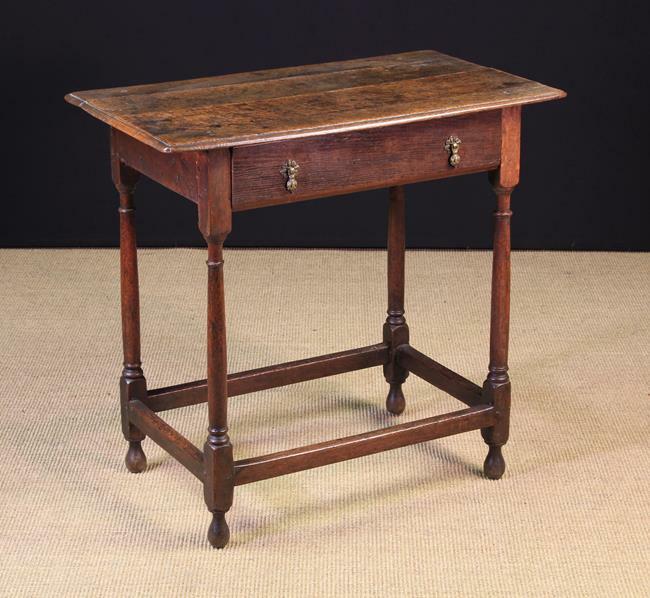 A George III Oak Tripod Table. 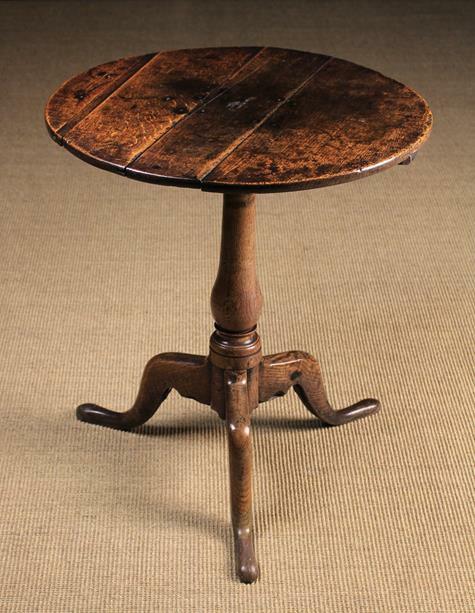 The round top on baluster turned centre column and outswept legs, 27 in (69 cm) high, 24 in (61 cm) in diameter. 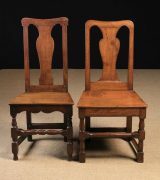 Two 18th Century Joined Oak Side Chairs. Both having a dipped top rail above a shaped centre splat, plank seat on turned legs united by turned stretchers. 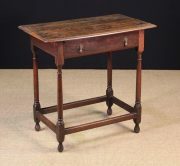 An Early 18th Century Oak Side Table. The planked top above a frieze drawer with ornately cast brass drop handles, standing on slender turned legs with pear shaped feet, united by peripheral stretchers, 28½ in (72 cm) high, 30 in (77 cm) wide, 17½ in (45 cm) deep. 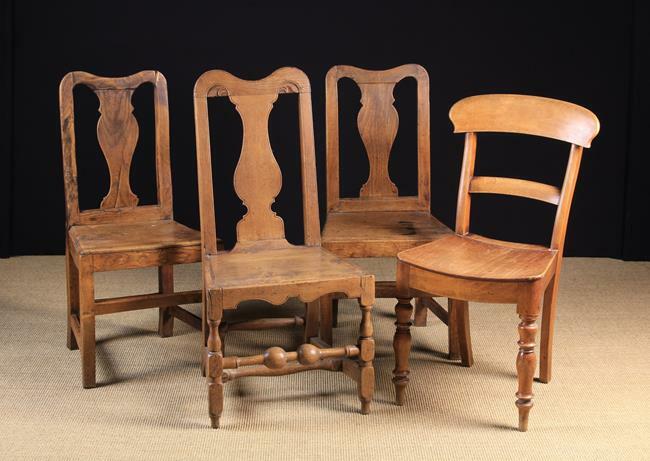 Four Chairs: A pair of 18th Century joined oak side chairs with vasiform splats below dipped top rails, plank seats on square legs united by stretchers. 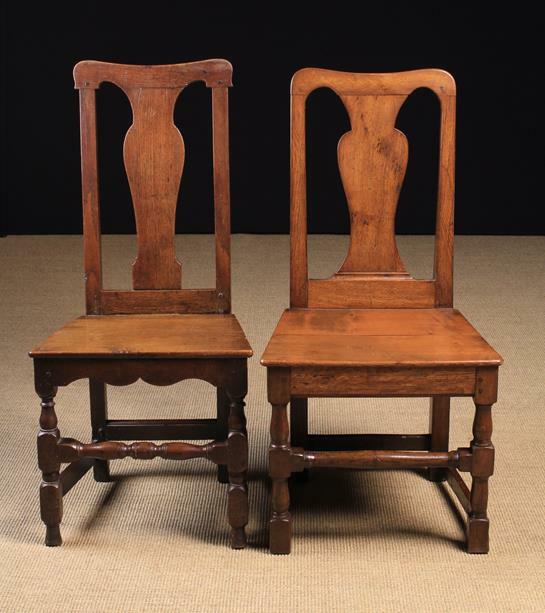 A joined ash chair with dipped top rail and vasiform splat bordered in an incised line and carved with small leafy flourishes, above a plank seat on turned legs united by a bulbous knopped front stretcher. And a 19th century East Anglian side chair with curved seat on turned legs Circa 1860-90. 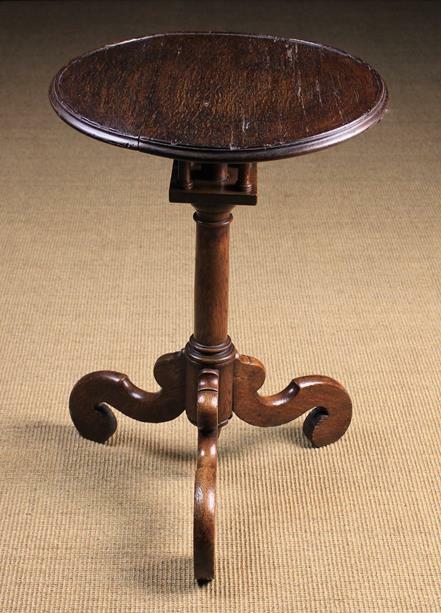 An Early 18th Century Oak Tilt-top Tripod Table. The dished circular top with raised edge on a spindled 'bird-cage' support. The columnar pedestal with turned pendant finial to the terminal, raised on boldly scrolling silhouette-cut plank legs, 27½ in (70 cm) high, 18½ in (47 cm) in diameter. 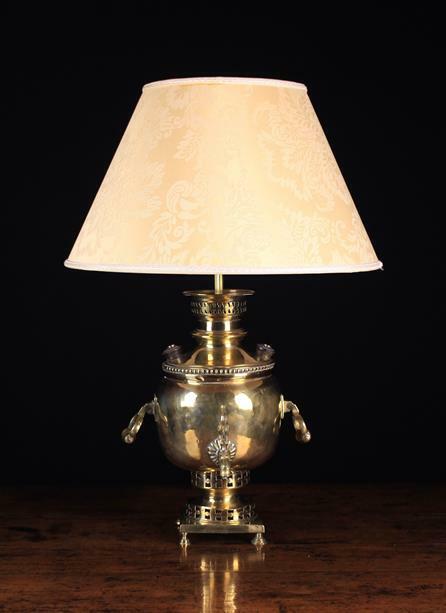 A Brass Samovar converted to a side lamp, 19 in (48 cm) in height. 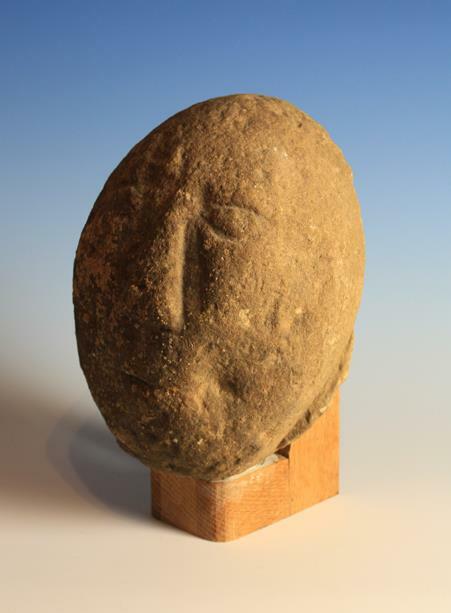 A Carved Stone Head mounted on an oak stand, 10½ in (26 cm) overall height.